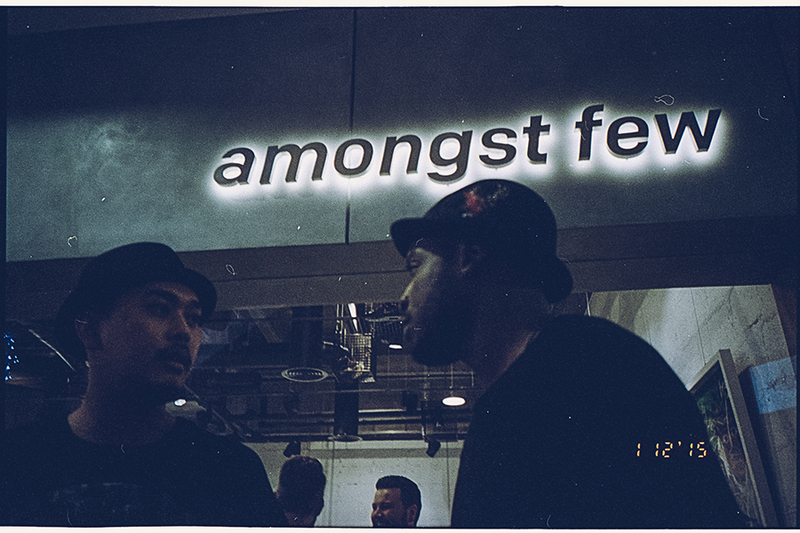 amongst few launched its flagship store last week to friends, family and wider shared community, bringing together the city’s leading creatives to celebrate the new brick and mortar space. Designed by cofounders Florian Moser and Michael Taylor, the two derive the store concept from their eclectic British, Jamaican, Austrian and Australian origins with nods to cofounder Khalid Bin Hadher's Emirati heritage and the birthplace of the brand, Dubai. amongst few aim to bridge the gap between retail, art, music and lifestyle merging them into one cultural space open to all. With apparel, sneaker and accessory brands available to purchase including amongst few, Nike and Kuumba, as well as a range of records (Dilla to MJ to The Dark Side Of The Moon) and original artworks (Basqiuat, Damien Hirst, Banksy and Takashi Murakami) this is a standout lifestyle hub, regardless of region. And what makes this so much more is the very intentional design of the founders to build a space easily cleaned of its contents to open the floor to the local community in support of local arts programming and the burgeoning local scene – from screenings to exhibitions to new thought workshops. In the building of this store amongst few takes the brand from a streetwear apparel offering to a foundation for community, creativity and collaboration. The amongst few debut store is a 700sqft space underlined with a merging of raw materials, combining cement, steel and concrete, offset with subtle doses of natural ash wood and a stunning weeping fig tree. The multidisciplinary design incorporates clean lines and sweeping angles – a measured balance between simplicity and detail to further accentuate the classic premium readytowear basics that amongst few is synonymous for. The antithesis to the gold and glitz, amongst few and the new store are a reflection of a city that has grown up out of its roots and is taking shape of its own identity with a young vibrancy at its core. The amongst few brick and mortar offering is a destination for any individual looking to scratch beneath the surface of the city and to hear the heartbeat of real local youth culture.